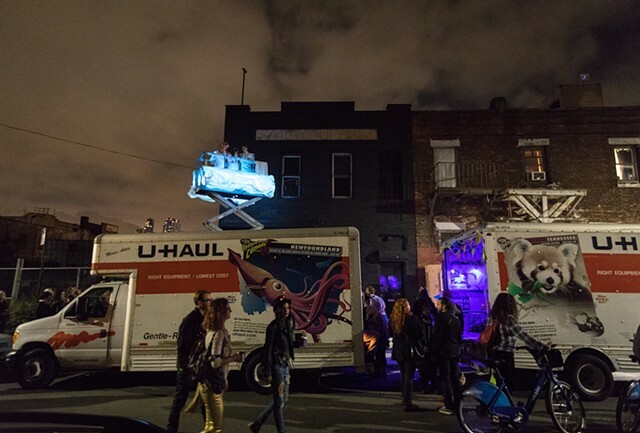 Two sister cities, New York and Philadelphia each hosted a Lost Horizon Night Market: an open source creative platform where artists create interactive experiences inside box trucks and showcase them in late night guerilla pop-up exhibitions. At The Lost Bridge Exchange, no one is a spectator. Strangers become friends you haven’t met yet. By providing a pop-up solution to make underutilized places more creative, we are offering an outlet for the community to see what is possible in places they encounter in their daily lives. For those who know these places as barren, industrial and empty, they may find wonder, entertainment, a new frontier for creativity and interaction. For the participant, we are offering new and novel opportunities for both the creative and curious to connect and foster new relationships in these interactive and exploratory projects. We purposefully design the project to blend into the city landscape: a tactical intervention for people to discover new ways to explore the city and the spaces within it. We encourage participation, raise questions and conversations, push comfort zones, and breed a long-lasting creative desire within and between communities.